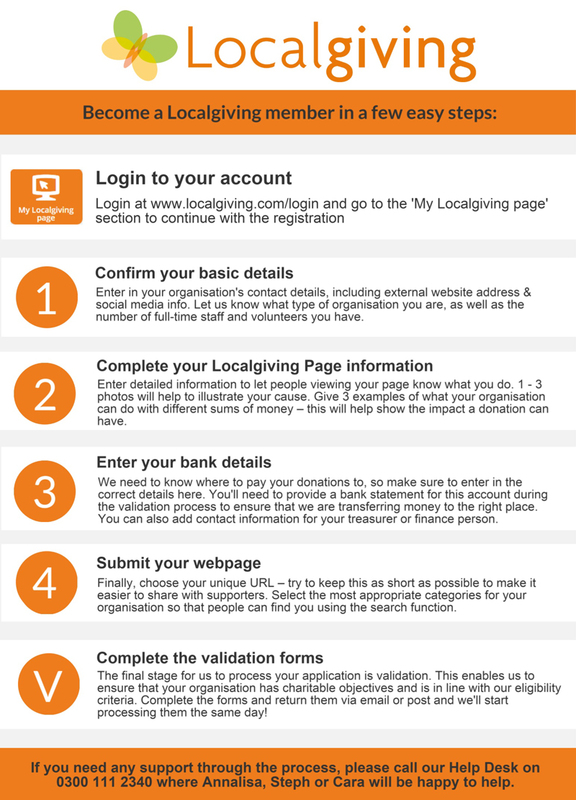 Interested in joining Localgiving as a group, but not sure what the application process involves? We've put together a quick step-by-step guide to help explain. What eligibility criteria must charities and community organisations meet in order to register with Localgiving? Localgiving's mission is to support small, locally focused charities and community groups. As such, we do not allow national charities to register on the site. All organisations on Localgiving must be for the benefit of a local or regional community and cannot use the platform to raise funds for national or international projects.If an organisation operates at a local / regional level, but is part of a wider national body, it can still register with Localgiving providing it has a separate bank account and level of autonomy for the services it provides. All organisations on Localgiving must have a local / regional independent management committee that has management of a UK bank account in the name of the organisation and not an individual. Unfortunately, we do not accept old style building society accounts, which use a roll number to distinguish between account holders. Organisations that work solely for the benefit of medical research are not able to join Localgiving; however, if they are providing direct benefit to the local human population they are able to use the Localgiving platform. If you have any questions about Localgiving's eligibility criteria, then please do not hesitate to get in contacat with our friendly Help Desk on 0300 111 2340 or via help@localgiving.com. Our office hours are 9.30am - 5.30pm, Monday - Friday. All charities and community organisations on Localgiving are subject to a thorough validation process. We do this to ensure that any donation made through Localgiving is going to a legitimate charitable cause.